Panasonic reported a second straight quarterly profit in October-December, buoyed by restructuring and a slight improvement in sales overseas. Osaka-based Panasonic Corp. said Friday it booked a 32.3 billion yen ($360 million) profit for the fiscal third quarter, bouncing back from a net loss of 63.1 billion yen a year earlier. 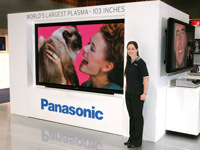 Panasonic returned to proft in the July-September quarter for the first time in a year. Sales for the third quarter came to 1.89 trillion yen ($21 billion), almost unchanged from a year earlier. Panasonic revised up its sales outlook for the full fiscal year through March to 7.35 trillion yen ($81.9 billion) from 7 trillion yen, and raised its operating profit forecast to 150 billion yen ($1.7 billion) from 120 billion yen. The company kept unchanged its forecast of a net loss of 140 billion yen.